Its all coming back around again as the Bulldogs start the rematches with conference teams from earlier in the schedule. This weekend’s rematch involves Western Michigan. And now with February staring us in the face, the PairWise Rankings (PWR), a main criteria for selecting the 16 teams for the NCAA Tournament, is becoming more important. Currently UMD is #14 and WMU is #18.
don’t take your spot. How do the Bulldogs move up? They need to win, period. No more so close or could haves. It has to be laser focus on winning. 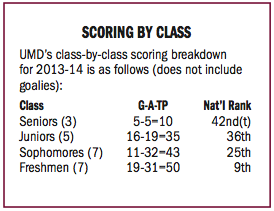 UMD has used up their slip-ups already this year. A loss at CC, giving up late leads, and just not coming out ready to play all have to stop. Looking at their record, 10-9-3, doesn’t look like a tournament team. But quietly the young Bulldogs have amassed wins while playing the #1 strength of schedule (SOS). Minnesota Twin Cities, who the Bulldogs are 1-1-1 against this season, is #2 in SOS. assured of playing good competition and ultimately giving them a chance to better their position. Looking Back Part II. In the last meeting, the Broncos and Bulldogs split a pair of games in Duluth. It was an evenly matched series that either team could have won wither night, so a split was fitting. Key to the Weekend. Goaltending closely followed by defense need to work together to stop the soft goals gives UMD a chance to win every game. UMD is a NCAA Tournament caliber team, but only when they come to play and play to their potential. The Bulldogs are getting close to being a complete team. If the goaltending can get back to a .910 save percentage this team will go places. I like to see the slight decrease in penalties recently. The team still has a way to go in that area. Now they need to eliminate the stupid behind the play penalties. St. Cloud state @ Nebraska Omaha: Last weekend showed that the Huskies defense was week. This seems to be a trend and with the Mavericks scoring they will earn the split. Minnesota Duluth @ Western Michigan: Speaking of penalties I expect a bunch this weekend. Special team will decide the games and I expect a split. If the Bulldogs can resist starting or retaliating they can get the sweep through power play goals. A renewal of teams split apart by conferences is the name of the first day of the North Star College Cup (NSCC). UMD meets the Purple Mavs of MSUM in the early game. Saint Cloud faces the Gophers in the late game. Banter has been going around speculating if the tournament will be, or become, a Minnesota staple for college hockey. For now we look for good games and fan support. With not much time before the first faceoff, we will cut the chase and get to the stats and picks. Picks by @afiskness. 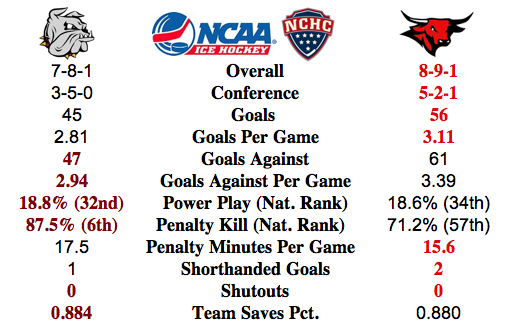 The NCHC is proving to be a league that is very tough every night and the expected outcomes just might not happen. Just after and impressive sweep in Omaha the Bulldogs just couldn't get it going at home last weekend against Denver. Similarly Miami at home playing a struggling Mavericks team couldn't play well enough to get a win either. My picks in recent weeks have not been good so I might need to go out on a limb and take a chance with the picks. Miami @ Colorado College: The bottom two teams in the league square off in what may actually be a very even matchup. This should be a split, but I will go with a Redhawks win and a tie. North Dakota at Denver: The Pioneers looked good on the road last weekend thanks to some great goaltending. North Dakota is hot having not lost an NCAA game in the past nine. This will be a split. 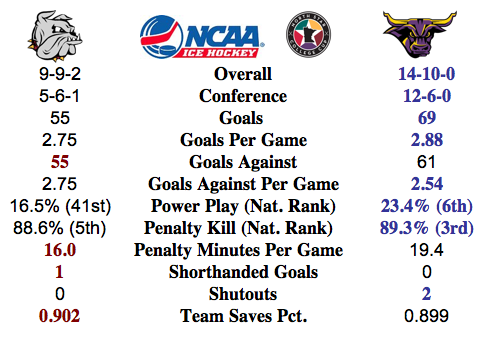 Minnesota State Mankato vs. Minnesota Duluth: The is a great matchup and probably a coin toss, I should probably pick the tie. The Mavericks had and impressive sweep of the Bulldogs of Ferris State last weekend, meanwhile the Bulldogs of UMD at least got a much needed tie and the extra point for the shootout. My gut says the Mavericks, but I think the Bulldogs effort will be better on the nuetral ice. Bulldogs win. St. Cloud State vs. Minnesota: The Gophers appear to be the better team right now as the Huskies have struggled of late. Gophers win. If these matchups hold I will go with the Gophers beating the Bulldogs and St. Cloud beating the Mavericks. The Bulldogs have climbed their way back up and over the 0.500 mark with the strong showing with last weekend’s sweep at Omaha. Now they are given the task of taking on Denver. 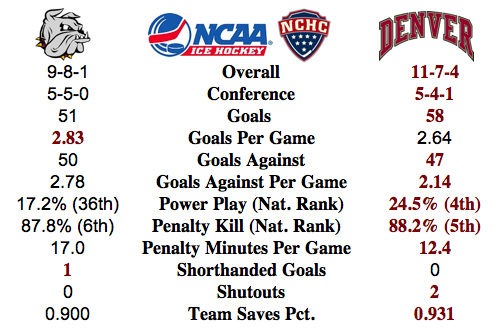 Looking at comparisons, it may look like this is a good matchup for UMD seeing Omaha already swept the Pioneers at Denver this season. That was early in the season before Denver got on track. Denver started the season with a sweep of Merrimack, but then proceeded lose five of their next six games. That was the stretch when Omaha swept Denver in a pair 3-2 OT games. totaled 19 goals and 31 assists lead by Alex Iafallo with 6-7-13. As a group they lead the NCHC for freshman points and are ninth in the nation. Dueling Goalies. Sam Brittain is back in form and is playing strong. Although he has six of the team’s losses on his record, he currently has a 1.96 and a 0.934 saves percentage. This weekend Brittain’s Pioneers will face arguable the hottest goalie in the NCHC in Aaron Crandall who was in net for both wins last weekend en route to being name NCHC Goalie of the Week. Crandall is #1 for now and will keep it as long as he plays well. But McNeely has to be ready for when coach Sandelin deems a change is needed. It is not a secret that goaltending has been a concern for the Bulldogs this season and the netminder should not be expected to win games night after night. Picks by @afiskness. I was happy to see UMD come out last weekend and play solid and get a couple of victories. A lot of the credit goes to the Crandall in the net, but the team played well as a whole. Hopefully this will continue to this weekend against the Pioneers. All eight teams are in action this weekend. 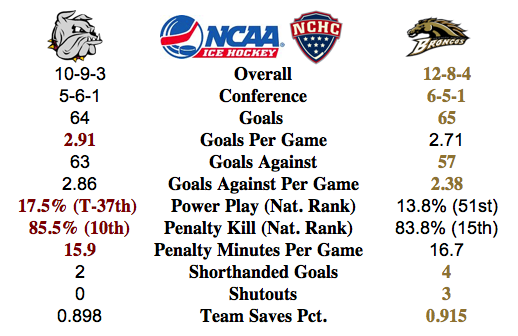 There are three NCHC conference games and two non-conference games. Denver @ Minnesota Duluth: The Bulldogs played good last week and got the road split but I am not sure they have the mojo yet to sweep a good Pioneers team at home. Split. Western Michigan @ St. Cloud State: The Huskies are the better team playing at home. The Broncos have some momentum, but I don't think they have enough to get more than a split at St. Cloud. Split. Omaha @ Miami: To teams as cold as ice, so something has got to give. Miami being the home team should get the nod, so I will say a Redhawks win and tie. North Dakota versus Bemidji State (home and home): North Dakota holds the huge advantage in this series, I am going to go out on a limb and say North Dakota win and tie since this series means more to the Beavers than North Dakota. Providence @ Colorado College: Only one way to pick this: Friars sweep. The Tigers have to show me something before I will pick them to win a game.